After combing through the docs and several how–tos on deploying the Squid proxy server – none of which really did everything I wanted, of course – I’ve finally gotten to the format below. Installing Squid is easy-peasy – it’s in the standard package repos for the major platforms (CentOS/Fedora/RHEL, Ubuntu/Debian, etc) – so just run yum install squid or apt install squid on your platform of choice (my exact install command on Ubuntu 18.04 was apt -y install squid net-tools apache2-utils). What I wanted was an “open” (password-protected) proxy server with disk-based caching enabled that would cover all of the ports I could reasonably expect to run into. Why “open”? Because I want to be able to turn it on and off on various mobile devices which may (or may not) have stable-ish public IPs. 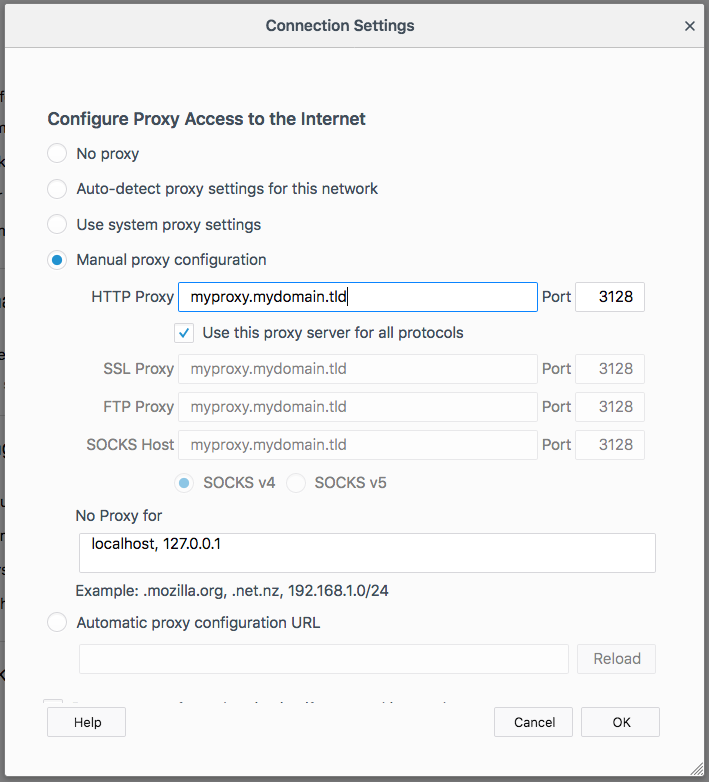 To verify your proxy settings are correct, visit IPv4.cf with both the proxy off, and then again with it on. If your reported IP address changes between visits (with the second check being your Squid server IP) – congratulations! You have successfully deployed a Squid proxy caching server. After running my new server for a while, I was noticing an unusually-high level of bogus email arriving in my inbox – mail that was being spoofed to look like it was coming from myself (to myself). After a great deal of research, I learned there is a component of the DNS specification that allows for TEXT or SPF records. Sender Policy Framework was developed to help mail servers identify whether or not messages are being sent by authorized servers for their representative domains. Note: some DNS providers (like Digital Ocean) will make you use a TEXT record instead of a dedicated SPF record (which my registrar / DNS provider Pairnic supports). If they require it be via TEXT record, it’ll look something like this: TXT @ "v=spf1 a include:_spf.google.com ~all"
Note: those are actually tabs in my config file – but spaces work, too. Why did SPF cause my mail to be rejected? SPF is an extension to Internet e-mail. It prevents unauthorized people from forging your e-mail address (see the introduction). But for it to work, your own or your e-mail service provider’s setup may need to be adjusted. Otherwise, the system may mistake you for an unauthorized sender. Note that there is no central institution that enforces SPF. If a message of yours gets blocked due to SPF, this is because (1) your domain has declared an SPF policy that forbids you to send through the mail server through which you sent the message, and (2) the recipient’s mail server detected this and blocked the message. warren@datente.com rejected a message that claimed an envelope sender address of warren@datente.com. warren@datente.com received a message from 197.27.40.169 that claimed an envelope sender address of warren@datente.com. However, the domain datente.com has declared using SPF that it does not send mail through 197.27.40.169. That is why the message was rejected. After running into some wacky networking issues at a recent customer engagement, I had a brainstorm about a smart[ish] DHCPd server that could work in conjunction with DNS and static IP assignment to more intelligently fill subnet space. Lab network space is fairly-heavily populated with static assigned addresses – in a /23 network, ie ~500 available address on the subnet, about 420 addresses were in use. Not all statically-assigned IPs were registered in DNS. The in-use addresses were did not leave much contiguous, unused space (little groups of 2 or4 addresses open – not ~80, or even a couple small batches of 20-30 in a row). DNS was running on a Windows 2012 host. DHCPd (ISC’s) was setup on an RHEL 5×64 Linux machine. The problem with using the ISC DHCPd server, as supplied by HPSA, is that while you can configure multiple subnets to hand-out addresses on, you cannot configure multiple ranges on a single subnet. So we were unable to effectively utilize all the little gaps in assigned addresses. This would have the advantage of intelligently filling address gaps on a given subnet, and require less interaction between teams that want/need to be able to use DHCP and those that need/want static addresses. Or maybe what I’m describing has already been solved, and I just don’t know how to find it.